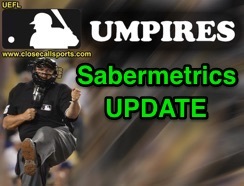 UEFL's MLB Umpire Sabermetrics report for May 2018 features 51 ejections and 478 Replay Reviews through 834 regular season games played (34.3% complete). Click here for last month's stats. Though ejections are projected to decrease year-over-year, based on current rates, replays are projected to enjoy a modest increase. >> 51 Total Regular Season Ejections through May 31, 2018 (on pace for 149 ejections this season). >> Umpires were 63.2% accurate on calls associated with ejection. >> The New York Yankees led MLB in ejections. The D'Backs/Padres led the National League. >> Manager John Gibbons led MLB in ejections. >> Umpire Brian Gorman led all umpires in ejections. >> Chief Brian Gorman's crew led all umpire crews in ejections. >> Most ejections occurred in the 3rd inning; Ejections from 7th and on comprised 43% of all tosses. >> Most ejections occurred on Wednesday. Weekend series (Fri-Sun) featured 41% of all heave-ho's. >> The most common reason for ejection was Balls/Strikes, followed by Fighting. >> All else equal, a team tied at the time of ejection ended up winning the game 65.0% of the time. >> 478 Total Replay Reviews, of which calls were affirmed 51.7% of the time (48.3% overturned). >> The Atlanta Braves used replay more than any other team, but were fairly unsuccessful. >> The Kansas City Royals were the League's most successful team in review (13-for-15). >> The BAL Orioles experienced fewer reviews than any other team, and were 29th best in MLB. >> The San Diego Padres were the worst MLB team in terms of Replay success (2-for-14). >> Umpires Danley, O'Nora & Wendelstedt were most reviewed. >> Larry Vanover's crew led all of baseball in replay activity, and performed at league average. >> Umpire Ben May led in accuracy with all calls affirmed by replay (4/4). >> Umpire Phil Cuzzi experienced the highest rate of calls overturned by replay (0/5). >> Umpire Angel Hernandez had the most number of calls overturned by replay (7 overturns). >> The 8th inning had more reviews than any other inning. 44% of all reviews occurred from 7th-on. >> Most reviews occurred on Saturday; Weekend series (Fri-Sun) featured 47% of all replays. 1. Ben May - 100.0% RAP (4/4). 2. Gary Cederstrom - 100.0% RAP (3/3). 3. Tom Woodring - 100.0% RAP (2/2). 4. Chad Fairchild, Stu Scheurwater - 83.3% RAP (5/6). 6. Gerry Davis - 80.0% RAP (4/5). 7. Ted Barrett - 75.0% RAP (6/8). 8. Barber, Visconti, Tumpane, Estabrook, Rackley, Timmons - 75.0% RAP (3/4). 14. Hunter Wendelstedt - 72.7% RAP (8/11). 15. Ed Hickox, Gabe Morales - 71.4% RAP (5/7). 17. Kerwin Danley - 70.0% RAP (7/10). 73. Angel Hernandez - 30.0% RAP (3/10). 74. Tony Randazzo, Mike Winters - 28.6% RAP (2/7). 76. Sam Holbrook - 25.0% RAP (2/8). 77. Todd Tichenor - 25.0% RAP (1/4). 78. Tom Hallion, Quinn Wolcott - 20.0% RAP (1/5). 82. Brian Knight, John Libka, Shane Livensparger - 0.0% RAP (0/1). 85. Adam Hamari - 0.0% RAP (0/3). 86. Phil Cuzzi - 0.0% RAP (0/5). 6 Overturns: Cooper, Holbrook, Kellogg, Meals, O'Nora, Ripperger. Total Games Played Through May 31, 2018: 834 of 2430 (34.3% of the season has been played). Ejections: 51. (Compare to 56 through May 2017). Pace is 149 ejections / 2430 games played. "Team most active" (Team with most Ejections): NYY 5; ARI, SD 4; COL, LAA, MIL, SF, TOR, WAS 3. "Team least active" (Team with least Ejections): BAL, BOS, CLE, CWS, LAD, MIN, TEX 1. "Manager ejections leader" (Most Ejections): John Gibbons 3; Snitker, Hurdle, Counsell, Gardy, Servais 2. "Player ejections leader": [24 Tied] 1. "Umpire leader" (Most Ejections): Brian Gorman 6; Wendelstedt 5; [8 Tied] 2. "Crew most active" (Crew with most Ejections): Gorman 9; Vanover 6; G Gibson, West 4. "Most accurate umpire" (Umpire with greatest QOC): [4 Tied] (2 Y / 0 N + 0 U = 1.000 QOCY). "Overall QOC percentage" (Overall QOC Y value): .632 (24 Y / 14 N) + 13 Irrecusable = 51 Total. "Team Status Pre-Ejection" (Winning-Losing-Tied [W-L-T] Record prior to Ejection): 10-21-20. "Team Status Post-Ejection" (Game Record [W-L]): 23-28. (Delta: 13-7; WPCT: .650). By Inning: 3 (10); 8 (9); 6 (8); 7 (7); 9 (6); 5 (4); Extras (3); 1 (2); 2, 4 (1). By Reason: Ball/Strikes (29); Fighting (7); Check Swing, USC-NEC (3); INT, Replay, Throwing At (2). By Day of Week: Wednesday (10); Saturday, Sunday, Thursday (8); Monday, Tuesday (6); Friday (5). Replay Reviews & Decisions Rendered: 478, .517 RAP (247/478). On pace for 1393 replays. "Team Most Used" (Used Replay Review most often): ATL 26; MIN 23; PHI, PIT, SEA, STL 20. "Team Least Used" (Least use of Replay): BAL 7; HOU 9; MIL 10; CIN 11; CWS 12; LAD 13. "Most successful team in review" (Team with highest TSP): KC Royals - .867 (13/15). "Least successful team in review" (Team with lowest TSP): SD Padres - .143 (2/14). "Umpire most questioned" (Most Reviews): Wendelstedt, O'Nora, Danley 11; Cooper, Hernandez 10. "Crew most questioned" (Most Reviewed Crew): Larry Vanover 29; Culbreth, Meals, Danley 27. "Most accurate umpire" (Umpire with greatest RAP): Ben May - 1.000 (4 Y in 4 Total). "Ump of greatest overturn" (Umpire with lowest RAP): Phil Cuzzi - .000 (0 Y in 5 Total). - By Inning: 8 (74), 9 (61), 6 (58), 5 (56), 7 (51), 4 (47), 3 (42), 2 (34), 1 (31), Extras (24). - By Reason: Out/Safe [Force - 1st] 118; Out/Safe [Tag - Into Base] 66; Out/Safe [Tag - Stolen Base] 57; Out/Safe [Pulled Foot] 39; Out/Safe [Tag - Pickoff] 36; HBP/Ball 23; Catch/No Catch 19. - By Day of Week: Sat (88), Fri (80), Wed (77), Tues (69), Sun (57), Thurs (55), Mon (52).